When the euro began circulating in 2002, it was seen as a great step forward in the economic and fiscal integration of EU members. Now it is a source of great divisiveness, as the EU struggles to manage economic crises within the confines of the euro. This brief explores what might happen if managing that struggle proves too difficult, and the euro loses some of its 17 members. It concentrates on the effects on economies and consumers’ lives, rather than on why this scenario is reached. It also examines the implications for business. Scenario 1: Losing PIIGS. Economic and political strains force some combination of Portugal, Ireland, Italy, Greece, and Spain (for which PIIGS is an acronym) out of the eurozone. If, on the heels of some or all of the PIIGS, France also leaves, then the euro-zone becomes—in effect if not in name—an enlarged Deutsche-mark zone. Scenario 2: Euro A and B. In this scenario, the euro splits into two separate currencies, essentially northern and southern euros. The northern bloc is composed principally of Germany, Austria, Finland, and the Netherlands, while the south is built around Italy and Spain. It is unclear which bloc France would join. This split might be triggered by German voters essentially forcing their country out of the euro bloc, instead of continuing to bail out other EU members. Scenario 3: End of the euro. In this scenario, the currency ends its existence, and the countries of Europe revert to their former national currencies. Note: Size of bubbles reflects GDP (in current US Dollars) as a share (%) of world GDP at the time of break-up. 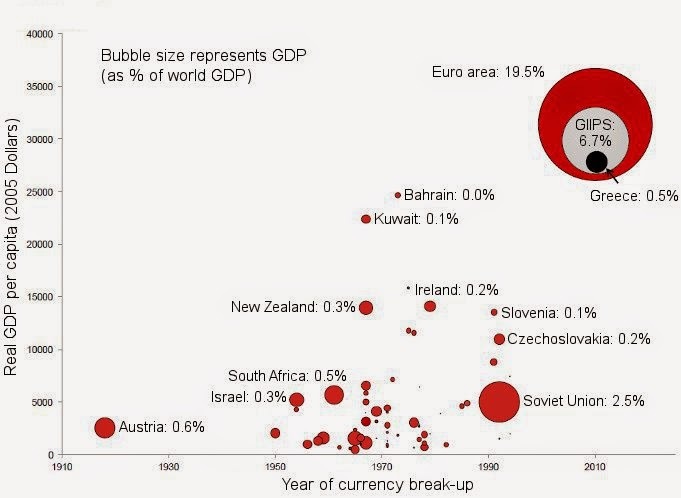 GDP per capita at the time of break-up is measured in 2005 Dollars, and we have included a full-blown eurozone break-up, a limited break-up involving only PIIGS countries, and a unilateral Greek exit in 2012 for illustrative purposes. Euro zone and Soviet Union GDP per capita are calculated as an average of values for the individual countries making up the currency unions. Due to data restrictions, Austria is the only country included from the Austro-Hungarian break-up. Any breakup of the euro-zone would have different levels of effects on the various actors. The strongest and most widely varying effects will occur within the EU itself, but repercussions could be severe for the rest of Europe and even the rest of the world. It will be very important how sudden, planned, or mutually agreed-upon any breakup is. Precipitous, chaotic events are likely to magnify the effects of euro-zone dissolution. The North. The strong center of the European economy is Germany—and Austria, Finland, and the Netherlands are often grouped with it. Luxembourg, Slovakia, Slovenia, and Estonia are likely to be able to remain with this group if the euro-zone splits. France would “make every effort to stay in the euro” although dramatic currency appreciation after a eurozone fracture could make this difficult. The South. These are the PIIGS (Portugal, Italy, Ireland, Greece, and Spain) that are the source of the crisis. Tiny Cyprus and Malta would probably follow their lead if the PIIGS left the euro-zone, due to integration with larger neighbors. Western Bystanders. These are the Western European countries that don’t use the euro. They include EU members Britain, Sweden, and Denmark, and also non-members Norway, Switzerland, and Iceland. Eastern Europe. With lower levels of wealth, the countries of Eastern Europe—which include EU members and non-members—would feel effects differently than would Western Europe. They would have fewer resources to deploy against a crisis, to begin with. Effects of a euro-zone collapse are diverse, and would range from those likely to precede a collapse to those that are likely to persist for decades. The unraveling of countless business deals and financial transactions, and the need to create whole new currencies, would cause financial dislocation. The euro would oscillate in value, disrupting trade and finance. As the transition got underway in an exiting country, domestic transactions would be re-denominated in new currency. Old currency would have to be used for a period of a month or two while new currency was produced.Transactions and contracts that crossed borders and involved an exiting country would be in peril. Capital controls, including possible moratorium on payments, might be introduced. If contracts remained denominated in euros, widespread defaults and bankruptcies would be triggered for lack of hard currency in the exiting country. Already, some non-financial companies such as France Telecom and grocer Tesco are reducing euro holdings and avoiding long-term contracts in anticipation of potential problems. Finance across Europe would be disrupted: by rising interest rates, liquidity fears, and exposure to debt in exiting nations. British banks, for instance, have an exposure of £170 billion in the PIIGS. Impacts could spread to North American banks as well. Exiting countries would likely have to choose between further austerity and policies likely to induce inflation. A eurozone breakup such as described in Scenario 1 would trigger severe recessions in exiting countries, and might tip the entire world economy into recession. Overall impacts in the eurozone would be harsh, though estimates vary. ING, for instance, forecasts a 12% cumulative drop in output over the first two years, which is worse than the losses of the 2008 crises, but not an outright depression. In 2016, eurozone output might be 10% lower than it would have been. The “south” of Europe. Exiting countries would fall into a depression due to severe disruption to all economic activities and near-cessation of cross-border trade. Rest of Europe. Intra-European trade will be severely disrupted by currency problems and cascading economic contraction, probably triggering a general European recession. Sweden, for instance, sends 70% of its exports to Europe. Rest of the world. A Euro zone breakup would likely trigger a global recession, due to financial turmoil and trade reductions—with the US and China being hit hard on the trade front. Investors fleeing to safe currencies might trigger deflationary shocks in the US and elsewhere. Britain has reportedly made plans to prevent a damaging surge in the pound’s value due to people switching from the euro. The effects of large states like Italy and Spain leaving the eurozone could precipitate “years of global depression,” as one analyst put it, forecasting 20% unemployment in World 1. Recession would reduce state resources that could be devoted to stimulus or amelioration of the recession’s effects, and at the same time European countries may be in the midst of spending huge amounts of money to try to combat further euro fracturing. One institute estimates that just dealing with a Greek default and exit could cost €1 trillion, mostly in funds to prevent additional exits. Asset prices would drop in many parts of the eurozone, probably beginning before an actual breakup. Home prices, retirement accounts, and stock portfolios would all take a hit. It has been projected that even if Greece exited on its own, housing prices would drop in all the PIIGS, and a broader eurozone breakup with other countries abandoning use of the euro might cause severe reductions in home values of 18–36% in the PIIGS. In the short term, there might be widespread shortages of traded goods within Europe or even globally for products imported from European countries, as business processes were disrupted by general uncertainty around the euro. Exiting countries might see sharp shortages for months due to severe interruptions in trade. Gray and black markets for many kinds of goods would develop to fill gaps. Economic turmoil in Europe could inspire increased migration within Europe and to other parts of World 1, as people seek countries that are less hard-hit by a crisis. As a preview, tens of thousands of people from Greece, Ireland, and Portugal have left their homelands in the last couple of years for other parts of World 1 and, in the case of the Portuguese, former colonies like Brazil and even Angola. A seminar in Greece on emigrating to Australia attracted 42 participants in 2010. In 2011, 12,000 people signed up for the event. Financial collapse could create hardship for the large numbers of expats within Europe. The British government is said to be planning for potential evacuations and emergency financial aid for British citizens who might be stranded or cut off from bank accounts in Spain and Portugal. The UK has also supposedly prepared contingency plans to seal its borders if unrest in Europe spurs mass migrations. New currencies in exiting countries would lose 50% or more of their value. In addition, these economies would also likely be hit by double-digit inflation, further lowering buying power. Exports from China, the US, Japan, and elsewhere would drop. One analyst suggests that in the case of Greece, a currency replacing the euro would be devalued sharply, on the order of 65%. This would slash Greek buying power for non-Greek goods. Over the longer term, many citizens of exiting countries would simply be unable to afford some of the goods and services that had been within reach while they held euros, and they would have to do without or find cheaper versions. The EU and the euro are meant in part to give Europeans a unified sense of identity, to smooth out their internal differences and present a united front to the world. To some extent this has succeeded, with most Europeans feeling that they have an identity beyond their own nationality. A failure of the euro would set those ambitions back, likely for decades. It would reveal how national identities are still very strong, and how they ultimately trump any European identity. The citizens of states leaving the eurozone might feel abandoned by the rest of Europe, with daily reminders in their hands in the form of their revived currencies. This may revive a sense of national identity in zone-leaving states and beyond. Efforts to further the integration of EU will be set back for some time, and will be subject to increased doubts based on the failure of solidarity over the euro. A euro-zone breakup would have political effects in Europe and beyond. Expansion of the EU might slow, with more skepticism on the part of existing EU members and would-be new entrants. EU members might in particular doubt the wisdom of taking on larger, poorer, more culturally distinct countries such as Ukraine and Turkey. The power of the EU to shape and persuade the policies and actions of members and aspiring members would falter. Hungary, for example, is already seen as defying EU warnings and “slipping back toward authoritarianism,” despite its membership in the bloc. The faltering of the European ideal could open the crack to more severe intra-European disputes, with the EU less able to referee. A Polish politician has gone as far as warning of actual armed conflict breaking out. Even short-term business plans should now take into account potential effects of potential eurozone defections, of efforts to counter this, and of pan-European recession brought on by these issues. Among the concrete preparations that businesses should consider, analysts suggest, are writing contracts with a possible euro collapse in mind—including specifying the currency of settlement, alternate currencies, place of jurisdiction, and an alternative place of jurisdiction. Another recession in the next few years could deal a long-lasting blow to consumer confidence in World 1, given that consumers are still feeling the effects of the late 2000s recession. This would open the door to more drastic policy and social responses than have been contemplated in recent years. Consumers in exiting countries might downshift their tastes to somewhat cheaper goods over the medium term as they lost buying power. Without the euro, Greece, for instance, is essentially a World 2 country. “Whither the Euro: Safe Harbor or Fractured Fate?” Knowledge@Wharton, June 23, 2010, http://knowledge.wharton.upenn.edu. “After €urogeddon? Frequently Asked Questions about the Break-Up of the Euro Zone,” Economist Intelligence Unit, 2011, 5, http://image.guardian.co.uk. Edward Hugh, “The Euro and the Scalpel,” Foreign Policy, August 9, 2011, www.foreignpolicy.com. Peter Apps, “Analysis: Euro Zone Failure Could Be Vast Geopolitical Shock,” Reuters, November 10, 2011, www.reuters.com. Willem Buiter, “The Terrible Consequences of a Eurozone Collapse,” Financial Times, December 7, 2011, www.ft.com. “After €urogeddon? Frequently Asked Questions about the Break-up of the Euro Zone,” Economist Intelligence Unit, 2011, 3, http://image.guardian.co.uk. James Campbell, “The Cracks in the Eurozone,” FTSE Global Markets, March 8, 2012, www.ftseglobalmarkets.com. Geraldine Amiel, “Euro-Zone Break Up Is Risk Scenario for France Télécom,” Wall Street Journal, February 22, 2012, http://online.wsj.com; Jonathan Sibun, “Tesco Plans for Eurozone Break-Up,” The Telegraph, December 8, 2011, www.telegraph.co.uk. Jason Groves, “UK Prepares Emergency Measures for Euro Collapse to Prevent an Influx of People and Money,” Daily Mail, December 28, 2011, www.dailymail.co.uk. Vuk Vukovic, “Euro Break-Up—Effects Beyond the Eurozone,” Don’t Worry, I’m an Economist! blog, October 17, 2011, http://im-an-economist.blogspot.com. “After €urogeddon? Frequently Asked Questions about the Break-up of the Euro Zone,” Economist Intelligence Unit, 2011, 6, http://image.guardian.co.uk. “EMU Break-Up,” ING Global Economics, December 1, 2011, 1. “Swedish Economy Hit by Eurozone Troubles,” The Local, February 29, 2012, www.thelocal.se. Matthew O’Brien, “Europe Has One Trillion Reasons to Keep Greece in the Euro Zone,” The Atlantic, March 6, 2012, www.theatlantic.com. “EMU Break-Up,” ING Global Economics, December 1, 2011, 11, 22. Barry Eichengreen, “The Breakup of the Euro Area,” in Europe and the Euro, University of Chicago Press, February 2010, www.nber.org. “Security: UK ‘Must Plan for Euro Collapse’,” BBC, March 8, 2012, www.bbc.co.uk. Helen Pidd, “Europeans Migrate South as Continent Drifts Deeper into Crisis,” guardian.co.uk, December 21, 2011, www.guardian.co.uk. Russell Shorto, “The Way Greeks Live Now,” New York Times Magazine, February 19, 2012, 40. Donna Bowater, “Eurozone Crisis: Foreign Office Plans Evacuation of Expatriates,” The Telegraph, December 18, 2011, www.telegraph.co.uk. Iván Turmo and Simon Bradley, “Poll Reveals European Mindset among Swiss,” Swissinfo.ch, December 11, 2010, www.swissinfo.ch. Associated Press, “EU Says Hungary Must Answer More Questions before Financial Assistance Can Be Considered,” Washington Post, March 7, 2012, www.washingtonpost.com. “In the Brussels Bunker,” The Economist, September 17, 2011, 54.